The Scratch programming language and community is ten years old and we celebrated that last night at a gala in NYC where the Scratch Foundation raised funds to support their work and they chose to honor me for our K12 CS Ed work in NYC. Here’s what I said to those who were there, I thought it would be nice to share it with the world. If you want to be filled with joy, take off the morning, head off to one of hundreds of middle school or high school buildings in NYC, and check out an introduction to software engineering class. Or go visit an elementary school home room where the teacher is doing a computing module in a history or science lesson. Here is what you will see. Roughly thirty young students, slightly more than half girls, and a rainbow of race, religion, and means. You will see girls in hijabs, boys with afros, kids who speak Spanish or some other language at home, all sitting together working on some sort of creative project, often in teams, solving problems, getting excited, and doing something that challenges them and interests them. And there’s a good chance that the software they are running on their computers will be Scratch, a visual programming language that makes building software as easy as building a Lego project. But Scratch is way more than a programming language. It is a community, free for everyone to use, now more than 70mm large, where the software creators share what they made with others and let others reuse and remake what they made. It is remix culture for making stuff on a computer. Scratch is also a gateway drug to serious software engineering. I know many young adults who started on Scratch and now work on some of the most serious programming challenges in computer science at big tech companies, startups, and the top research labs and universities. Scratch is a gift to the world from Mitch Resnick and his team of colleagues at the MIT Media Lab. You all know the saying, “don’t give someone a fish, teach them to fish”? Well that is what Mitch and his colleagues are doing with Scratch and they are doing it for tens of millions of people all around the world. I suspect the magnitude of this gift they have given the world is on the order of things like the personal computer, the smartphone, and the web. It’s that big. When I got interested in making sure every young person in the NYC public school system could learn to instruct a machine about seven or eight years ago, I didn’t really know how we were going to make that happen. Like most things I do, our organization, called CSNYC, just threw ourselves at the problem, listened and learned from those, like Mitch, who had been working on the problem for a long time, and we tried lots of things. One of the things we tried early on at The Academy For Software Engineering was Scratch. AFSE is a new public high school we started five years ago where students learn computer science and which has a few students in attendance tonight. And it has become an essential tool in our CS4All curriculum all over NYC. I see it in elementary school classrooms, I see it in middle schools, and I see it in high schools. I don’t know of a better way to get a student programming a computer than firing up the browser and pointing it to scratch.mit.edu. There are certainly other tools that are used to teach programming in K12 classrooms across NYC and across the country and the world. Scratch can’t teach everything. But it can get the student going, excited, productive, and hooked. And that is the biggest step. So while I am honored to be recognized this evening for the work we are doing in NYC and around the country, I want to make sure that everyone knows that our work would be impossible without the fundamental building blocks that have been put in place over the last 15-20 years, and Scratch is right up there at the top of that list. So thank you to the Scratch Foundation for this honor but mostly thank you for doing what you do and let us all help them keep doing that. 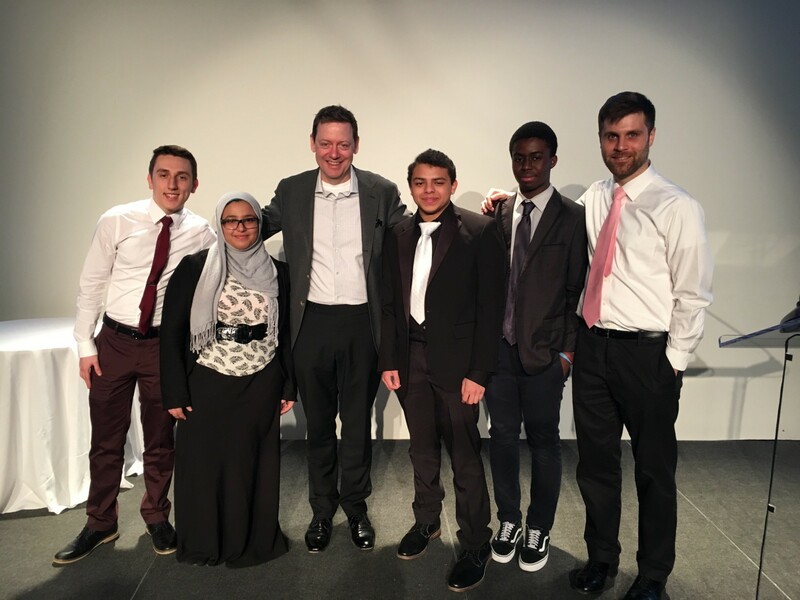 PS – Michael Preston, who runs CSNYC, sent me this photo of the students who sat with us at our table last night and Sean Stern who left a good paying job writing software for Amazon to teach them. A picture tells the entire story.